Sorting records in a table allows you to better understand the data you are working with. A typical example is sorting events, first by Route Id and then by From Measure. Alphanumeric—The selected field's values are sorted as text, even if they are numeric. Numeric—The selected field's values are sorted as numerals, even if they contain text. Ascending—The values are sorted from A to Z or 1 to 10. Descending—The values are sorted from Z to A or 10 to 1. To sort up to three fields at once, follow the steps below. Click the Advanced Table Sorting button . In the Sort by area, choose the first field by which you want to sort. Click Alphanumeric or Numeric to choose the sort type. This option will be chosen by default to match the field type. 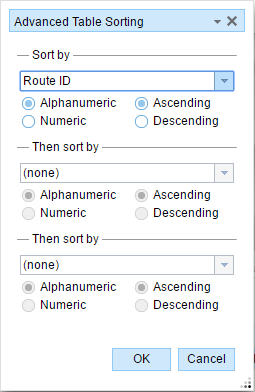 Click Ascending or Descending to choose the sort order. In the Then sort by areas, select the next field and choose a sort type and sort order. When a table's rows are sorted, only the table's display is modified.